So many physical and emotional changes emerge from a woman during the nine moons of pregnancy, birth and following her birth! We will briefly describe some of the benefits of massage therapy for the childbirthing year below, but please don’t hesitate to contact us if you have questions about your unique situation. Charisse and Jamie are experienced, dedicated, and nurturing massage therapists. As their beautiful belly stretches and grows, a pregnant person often feels ligaments loosening (especially in the pelvis), muscles moving, circulation shifting, hormones harmonizing, and many other subtle (and-not-so subtle) changes in her body-mind. We also recognize that many of these changes may create discomfort, as if she’s learning how to live a new body….which in a sense she is! Many women report that following their massage session they feel relief from: low back/hip/groin pain, leg swelling, stretched belly skin and uterine ligament strain, shortness of breath, nausea, upper back and shoulder issues, carpal tunnel-like symptoms, sciatica-like pain, “restless legs,” sore feet, insomnia, anxiety, and mood swings. Almost all women who receive competent and compassionate bodywork describe feeling more connected to their baby and feel more prepared for and confident about their labors. We take special care to encourage natural feminine posture and help women find grace and ease in their bodies. Most of the massage will be in a side-lying position to maximize oxygen-rich blood and nutrients going to mom and baby, to free the hip and back, and also to allow for baby to move into or stay in an optimal position for birth. As birth doulas we've found that the prenatal massage session is invaluable for a client to learn to feel comfortable with our touch, as this non-verbal communication will be felt most clearly in her labor. We also learn together what areas of her body are holding on to tension out of habit or for protection, and then we nourish those areas with nurturing touch so she can learn to consciously let go. During her labor, a woman may want nearly constant touch, or hardly any at all. We remain present and in the moment of each surge and sensation she feels and stay flexible to adapt to her changing needs. We offer ideas for touch and support to her partner or other companions present at the birth and encourage them to creatively support this laboring woman. Many women report that certain touch during labor relieved the intensity of painful sensations, helped them relax during and between contractions, helped them feel grounded and safe, staved off exhaustion, and enhanced their connection to their partners. For those clients looking for the experienced hands of a prenatal massage therapist during her sometimes lengthy early labor period, (but who already have a doula or are not planning to work with one), we offer "Early Labor" massage sessions. We would come to you (at home, birth center, or hospital) and offer touch for between one and two hours of your labor to help you get some rest, connect with your baby, support your baby's optimal positioning, and help prepare you to step into the unknown. Please inquire about pricing if you would like one of us to be on call for you. We enjoy working with non-pregnant people, too! Receiving massage and bodywork during this time of intense transition can help integrate new thoughts, feelings, and sense of identity, as well as ease the physical tensions that arise while adapting to a new parenting role. If a woman has been told her baby is positioned "breech" or "posterior," or wants to take steps to counteract the physical effects of modern sedentary life that can contribute to less-than-optimal baby position, she may be interested in a Balancing massage session. We have hands-on experience and formal and informal training from midwifes and health care providers in bodywork techniques that incorporate Gail Tully's Balance, Gravity, and Movement approach to optimal fetal fetal positioning. Learn more at spinning babies.com! 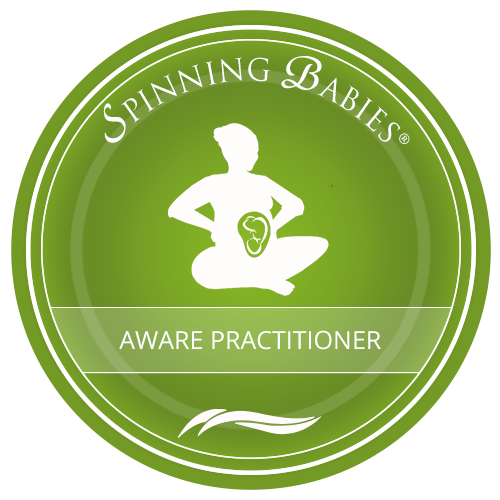 Jamie and Charisse are both "Spinning Babies Aware Practitioners." In the days and weeks following her birth, she begins a reintegration and renewal process that can be greatly facilitated by nurturing touch. Many cultures around the world massage their newly postpartum women daily for weeks! Some of the benefits of this work include: diminished anxiety, depression, and sleeplessness, more connection to baby, relief from aches and pains, including “nursing neck,” better breastfeeding relationship, decreased breast tenderness, abdominal muscle tone returning, womb and pelvic pain diminished, as well as less scar tissue adhesions from surgeries/procedures that may have occurred during birth. One 60-minute In-Office Prenatal Massage is included as a Birth Doula service. Please consult with your Prenatal Care Provider if you have concerns about getting a massage during pregnancy. Please contact us here to make an appointment! Jamie's office space is in the downtown La Mesa area of San Diego where she sees clients Wednesdays, Fridays, and some Saturdays. (Located at the San Diego Family Wellness Center: 8080 La Mesa Blvd. Suite 113, La Mesa, CA 91942 - see map) She is also available for In-Home sessions. Jamie teaches Perinatal (Prenatal, Labor, and Postpartum) Massage courses at a local massage school and at various community venues. We periodically have need of pregnant models to receive Prenatal Massage as part of our training. Please inquire if interested in participating and receiving a free massage!